Please join us for our next Community Call on Thursday April 4th at 12.00pm EST (NY). In this FOAM Community Call, we are joined by Adrian Brink. Adrian is the co-founder of the proof of stake infrastructure operator Cryptium Labs, working with Tezos, Polkadot and Cosmos. 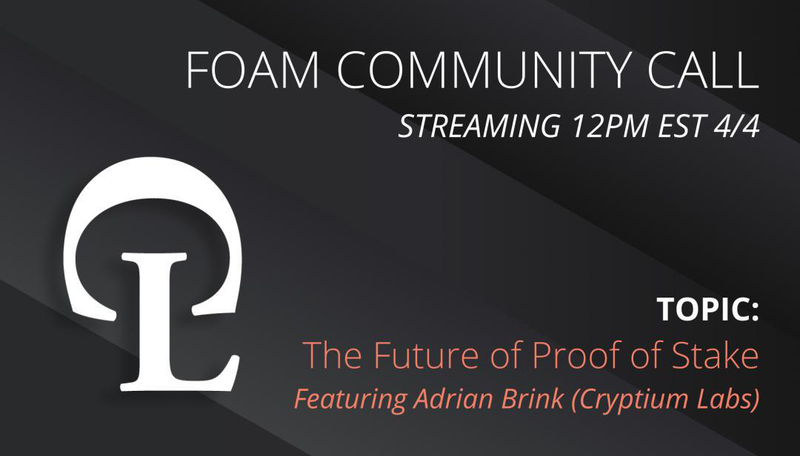 On the call we will discuss the future of proof stake, how Adrian sees the vision of an “Internet of Blockchains” and how that in turn might impact the work done at FOAM. We are also joined by Marcos, a community member many of you know as Zyndar. Zyndar is the current leader in all-time token rewards on the FOAM Map Leaderboard, and will walk us through his experiences and tactics for becoming #1. The next FOAM Community Call is happening tomorrow! Registered but unfortunately missed. Will a replay be made available? It was a great call, thanks all for joining! Youtube Link is up here! Thanks again to @Zyndar and Adrian for joining! Really great call all! My favorite so far.